Did You Forget To Pay A Ticket? - McGirr Law, P.C. Driving While License Invalid (DWLI)– if it happens to you once – you get a ticket. If it happens again – guess what? You can go to jail! It’s a Class B Misdemeanor when someone has previously been convicted for a variety of offenses, including driving while license invalid, DWI, and failure to provide insurance. There is some pending legislation to change all the rules surrounding this area of the law, but even if some changes are made. One of the best things you can do is make sure your license is clear. This is a very simplistic overview, and really, the reasons are more detailed that most people want to know unless it’s applicable to them in particular. So – how can you find out if your license has been suspended? First, you should have received a notice. But those notices go to the address listed on your driver’s license. Although the law requires you to change that information within 30 days of moving, there are SO many people who just forget to do it. So, maybe you didn’t see the notice. Tough luck – you’re still held responsible for knowing your license is suspended. 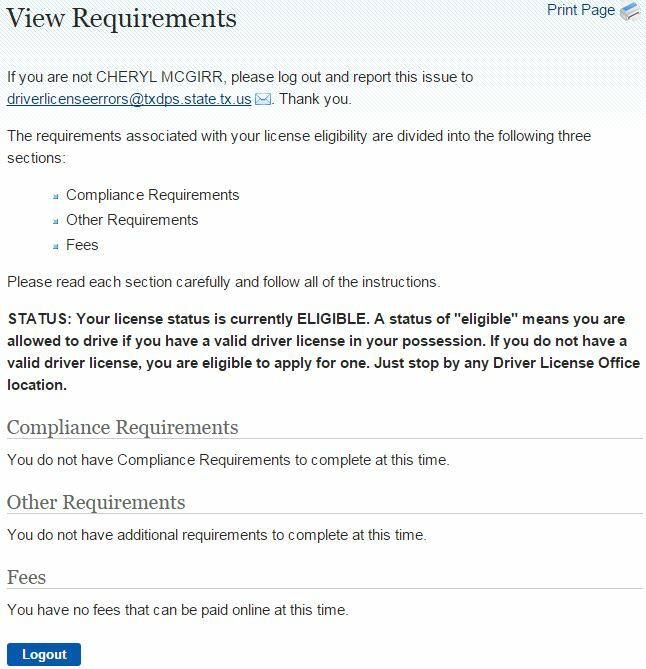 If you have something you need to do to get your license back, the requirements will be listed. The other site you have to check is: http://www.texasfailuretoappear.com/search.php Enter your information here and you will be able to see if you forgot to pay a ticket. It’s really not unusual. Some very smart Texans have forgotten to take care of a speeding ticket. This web site will let you know if that’s you and allow you to click through some related websites and in most cases, clear the violation. A few days later, DPS should receive the updated info and you should be able to reinstate your license. Along with the requisite fee of course. What did you expect? It is the government. Of course they will collect a fee.